It is late Sept 2010. Things are quite exciting with my run for Yakima County Auditor. Just left a editorial debate with my opponent at the Yakima Herald. the smoke will take a few days to clear. The big Sunfair parade is coming up. Parades are fun because my kids get to walk with me and pass out candy. Another fun part about this year is the annual CBR (Character Building Retreat) with some of the boys from IKE. Jeff Johnson is organizing this year, so we will unfortunately be doing way too many physical activites. I think he has a plan to hike to the top of White Pass to see the new addition to the ski area. I hope there is plenty of advill and beer available. Just celebrated my 12th Anniversary. The kids are going to school in Naches. Cole is 11 and the twins Juliana and Connor are 7. Juliana still wants to marry me. I will enjoy that for as long as it lasts. Its been a long road, but happy to still be living in the valley. Will be celebrating my 10 year anniv. with my wife Carrie, and find myself very fortunate to be able to spend so much time with my 3 children. The one down down side of owning a furniture store is that our mascot is a couch potato, which I am resembling more than I'd like to. Thank Mrs. Treat for this one. After getting back a paper from Mrs. Treat that did not receive the grade I felt it deserved. I said in a voice, apparently too loud and questioning, that it "was'nt fair!" Without missing a beat Mrs Treat shot back "If life were fair Peterson you would'nt have been born so damn ugly. Why don't you try harder?" I did'nt exactly enjoy the answer at the time, but I'm glad she said it, and that in retrospect, persistence has been one of my better qualities that has served me well in life. Bless you Mrs. Treat & rest in peace. 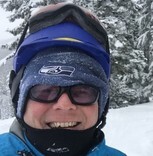 Mark Peterson changed "Now" picture. Mark Peterson added a photo to profile gallery. Mark Peterson has left an In Memory comment for Jerry Evans.